What a year! I have, I believe never worked so hard and so consistently. The mad idea I had just one short year ago, to make and sell my own jewelry, has actually worked and I now have a viable business on my hands. No-one is more surprised than me! I have always made my own stuff and it has always been admired but, I suspected, in a “there’s crazy Peg wearing her Margot Polo outfit again” kind of a way. I have never been about “fashion” or “on-trend”. What I make just comes from some strange place buried deep in my psyche. I work quickly and instinctively. My work is bold and colorful and I have been delighted with the reception. It gives me great pleasure to see how beautiful it looks on all of you. I have lived my life in North America, Europe and Asia but I was born and grew up in Australia, a land that is still very dear to my heart. 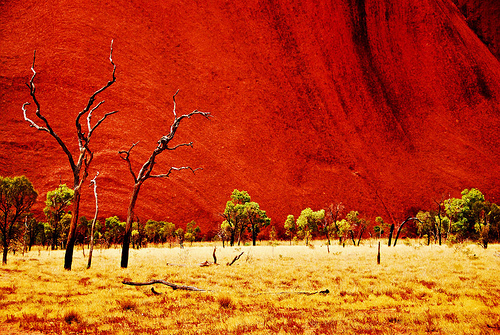 Our poets and writers extoll the beauty of this “sunburnt country”. My favourite piece of nostalgia comes from Dorothea MacKellar, where she compares the gentle beauty of England with the harsh beauty of her Australian home. A homesick Dorothea wrote the poem at age 19 when she was in England and originally published it under the title “The Core of my Heart”. What does this have to do with jewelry you ask? Somewhere, buried deep in my soul, is a respect for the harsh and the gritty. I like boldness. I relate to tough. 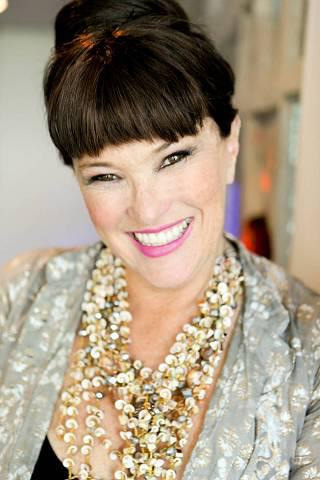 Rather than diamonds or rubies, I am drawn primarily to unpolished rocks in chunks or slabs, such as Amethyst, Aquamarine, Agate and Citrine, which I mix with reclaimed chandelier crystals, shells, coloured glass, wood, sometimes precious metals and even junk. They make a bold statement. I call them Jewels with Attitude. 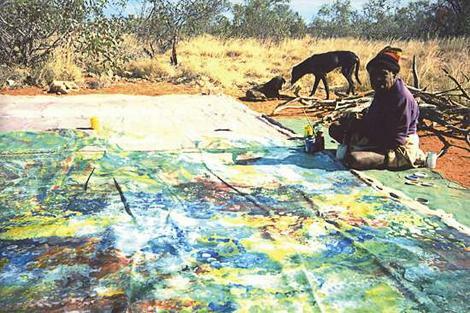 Nowhere is the Australian landscape more beautifully rendered than by my favourite Artist EVER – Emily Kame Kngwarreye, seen here painting her version of “Creation”. When asked what the painting was about she answered “Whole dam lot”. There will be more about Emily (and why I ADORE her) in future blogs.